Below the Otter Creek Falls was the site of Thomas Macdonough's shipyard, where the U.S.S. Saratoga was built in 40 days and other ships launched that defeated the British at the Battle of Plattsburgh, 1814. Erected 1949 by Vermont Historic Sites Commission. Location. 44° 10.182′ N, 73° 15.495′ W. Marker is in Vergennes, Vermont, in Addison County. Marker can be reached from Macdonough Drive 0.3 miles west of Main Street (Vermont Route 22A). Touch for map. Marker is in this post office area: Vergennes VT 05491, United States of America. Touch for directions. Other nearby markers. At least 8 other markers are within walking distance of this marker. The Vergennes Pump House (approx. ¼ mile away); Commerce at the Crossroads (approx. ¼ mile away); World War Memorial (approx. ¼ mile away); The Bixby Memorial Free Library (approx. 0.3 miles away); Early Life Along Otter Creek in Vergennes (approx. 0.3 miles away); Commodore Thomas Macdonough (approx. 0.3 miles away); Vergennes 150th Anniversary (approx. 0.3 miles away); Veterans Memorial (approx. 0.3 miles away). Touch for a list and map of all markers in Vergennes. More about this marker. 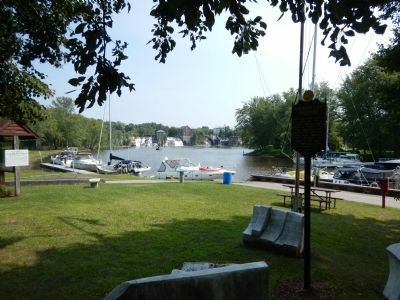 Marker is located in a small park near the water with an adjacent marina. 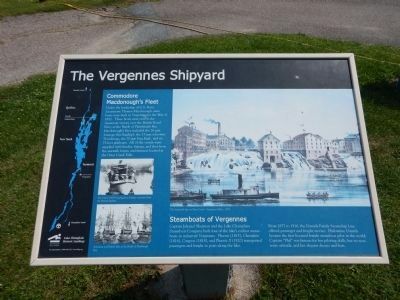 Under the leadership of U.S. Navy Lieutenant Thomas Macdonough, nine boats were built in Vergennes for the War of 1812. These boats were vital to the American victory over the British Royal Navy at the Battle of Plattsburgh Bay. 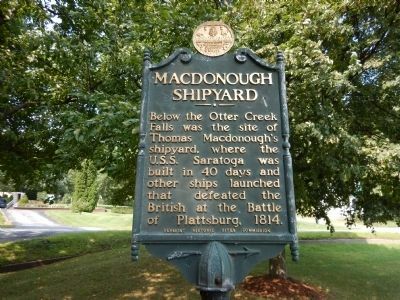 Macdonough's fleet included the 26-gun Saratoga (his flagship), the 17-gun schooner Ticonderoga, the 20-gun brig Eagle, and six 75-foot gunboats. All of the vessels were supplied with lumber, fittings, and shot from the sawmill, forges, and furnaces located at the Otter Creek Falls. Captain Jahaziel Sherman and the Lake Champlain Steamboat Company built four of the lake's earliest steamboats in industrial Vergennes. Phoenix (1815), Champlain (1816), Congress (1818), and Phoenix II (1820) transported passengers and freight to ports along the lake. From 1877 to 1916, the Daniels Family Steamship Line offered passenger and freight service. Philomène Daniels became the first licensed female steamboat pilot in the world; Captain "Phil" was famous for her piloting skills, her no-nonsense attitude, and her elegant dresses and hats. More. Search the internet for Macdonough Shipyard. Credits. This page was last revised on June 16, 2016. This page originally submitted on August 4, 2014, by Kevin Craft of Bedford, Quebec. This page has been viewed 403 times since then and 2 times this year. Photos: 1, 2, 3. submitted on August 4, 2014, by Kevin Craft of Bedford, Quebec. • Bill Pfingsten was the editor who published this page.